Dress #1: Vintage Jumper Dress by Studio 1950 on etsy.com. As a child, my grandmother was my whole world. She took care of me when my mother could not and was truly the nurturer and protector that I needed during those times in my life. She always carried that strong motherly/grandmotherly energy, and so dressed to fit the part; however, now that I have grown up and I look back at pictures of her when she was my age...I feel inspired by her style, her charm, and her beauty. If I was talented in the art of painting, I would have to paint at least ten masterpieces of her beauty; unfortunately, I am not talented in that area of art...yet. So, I have to settle with using her style as inspiration for my own. 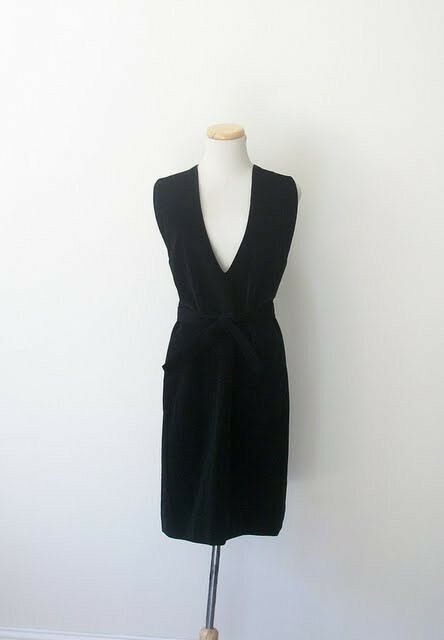 The first dress I found while digging through etsy's vintage treasures was this vintage 50's jumper dress for sale by Studio 1950. 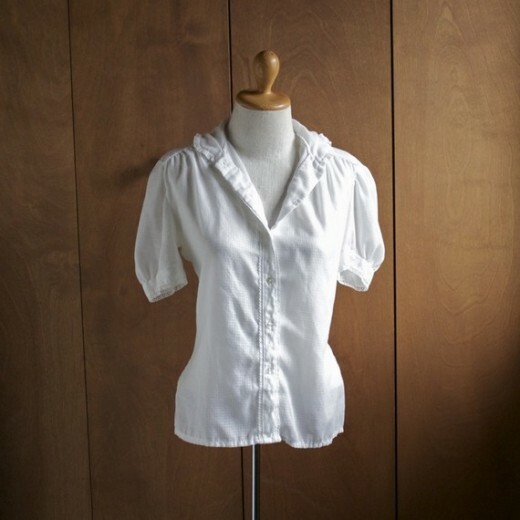 It has a deep v-neckline that would be perfect to display a white button-down shirt underneath, such as this vintage sheer lace blouse for sale by midwestisbest. This look, as you can imagine, would undoubtedly duplicate my grandmother's fifties look in the picture above. Not to a T, but definitely quite close...with a modern twist. Not to mention, this jumper dress could be multi-purposed and may even become a staple in your wardrobe...punk it up with a neon rock concert t-shirt or girly it up with a lacy pink ruffled blouse. 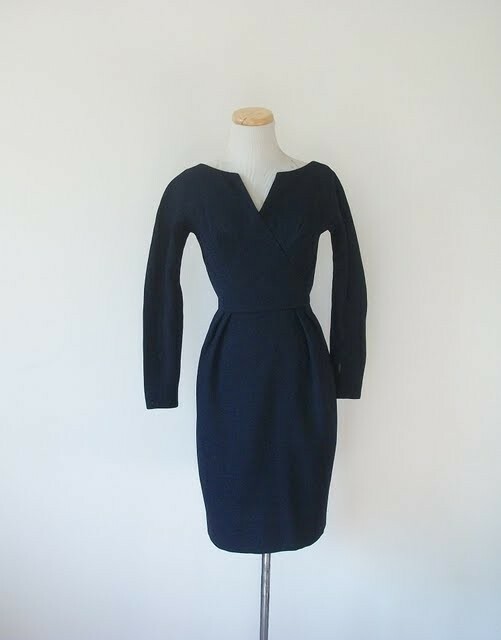 The second dress that was discovered was the navy blue wiggle dress, also for sale by Studio 1950 on etsy.com. It has a much dressier feel to it than the jumper dress and would not quite display the white blouse as well as the jumper dress, though. This dress would be perfect for an evening event or even for the office, depending on which accessories you choose to go with it. Either way, I have to say thanks to my granny for giving me such an inspiration with her impeccable vintage style. And how about a pair of vintage platform heels from mybabyjo.com to top (or bottom) off this lovely timeless jumper ensemble? The beautiful vintage photograph above is one of my grandparent's wedding day in the early fifties. 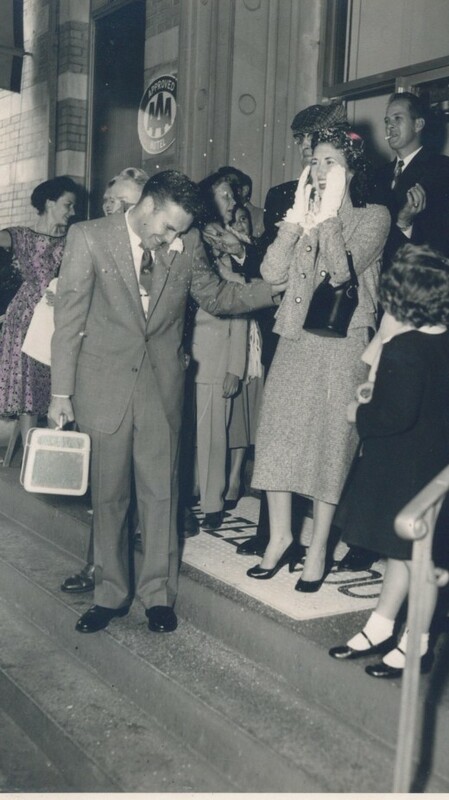 This is directly following their wedding, as they are heading to their car to depart for their honeymoon. This photograph is probably my most favorite of my grandmother because of the pleasantly surprised and super happy look on her face. One cannot help but to instantly notice her classic vintage suit dress with black pumps and matching black handbag. I just adore the white gloves ladies wore back in those days, although unfortunately they are not so practical for ladies today. Suit dresses are actually not so difficult to come across in modern stores today; however, if you want that truly vintage suit dress there are places online to snag them! The first Vintage Wool Plaid Suit Dress was spotted on ebay for only $24.99...but I am quite sure that this dress will be bid on very quickly. This is a wonderful deal on a vintage suit dress from any decade but this suit dress has the appeal of a forties or fifties' suit dress. I just adore the three large buttons down the front. This look is so classy and classic, you could wear it to work any day of the week or on outings into the city (whatever city you like to visit). I am not sure what time period this suit dress was manufactured in; however, the seller says that the zipper is metal which gives me a good idea that it was probably made before the sixties. Either way, it is an awesome find and matches my grandmother's honeymoon suit dress splendidly! 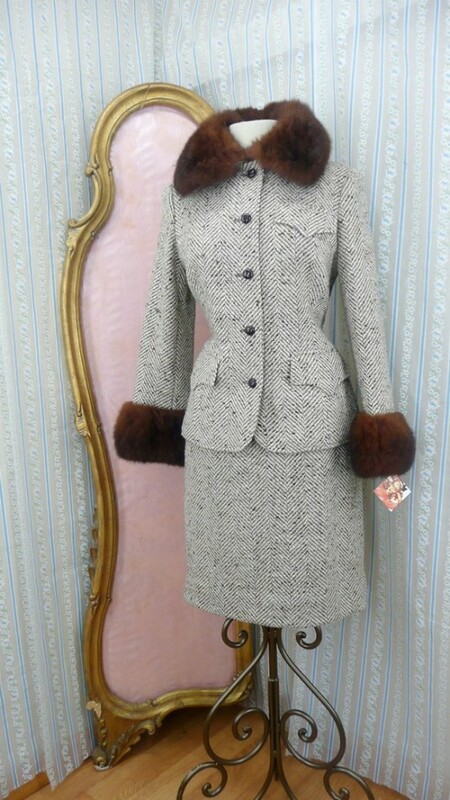 The second Vintage Suit Dress is to die for. I think I still drool when I glance at the picture. It is for sale by Mel's Vanity on etsy.com for $148.00. This may seem a little pricey, but for a piece such as this - with fur trim and satin-lined no less! 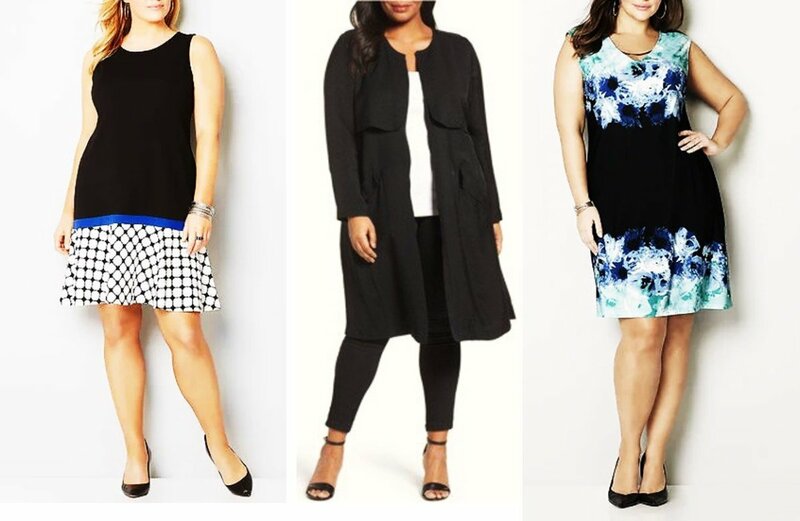 This suit dress will keep you warm, warm, warm...not to mention I can almost guarantee that no one else will be wearing the same suit dress as you to work this winter! The plush collar and sleeve trim is enough to time warm you into the forties or fifties...whichever is your favorite decade. Whatever decade is your favorite for vintage, I promise you that you can find a suit dress from that particular time period. 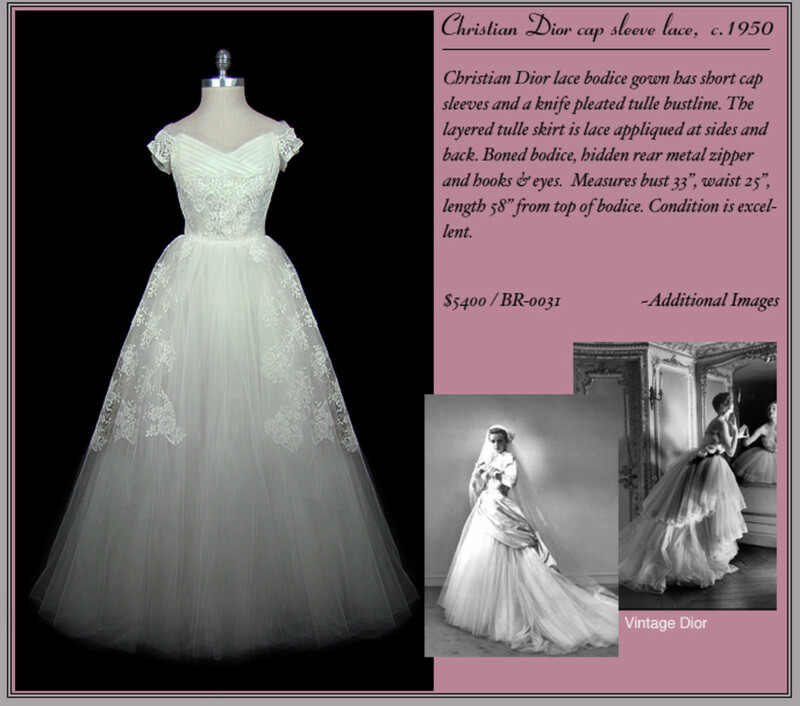 From the twenties through the eighties, you can find a whole array of vintage suit dresses to match any flavor or style. Try a flapper style suit dress from the twenties or a brightly-colored polyester suit dress from the seventies. And let's not forget the classy and mod suit dresses from the sixties...does anyone remember Jackie O? 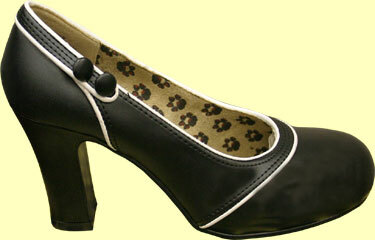 In an imitation of my grandmother's black pumps, I have selected a two-button pair of quintessential rockabilly heels. They look quite similar to her pair of pumps, but with an extra flair that is all my own. Do you love That 70's show? Are you obsessed with the swagger of the seventies? You can have your own seventies look, if you look in the right places. 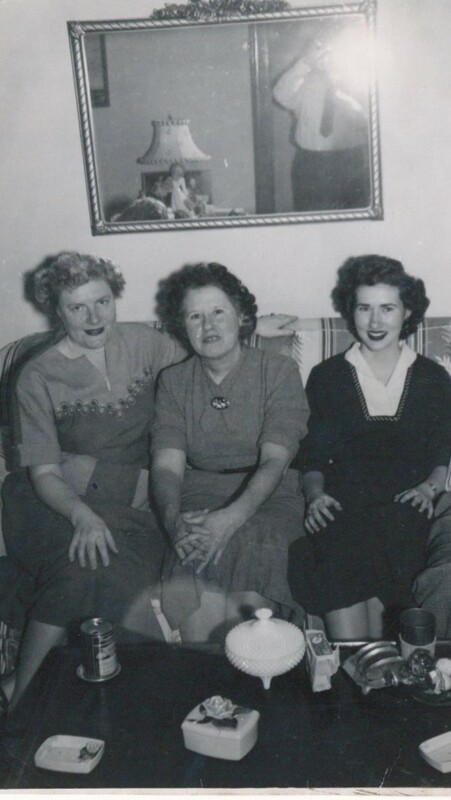 Here I have used another old family photograph, including my grandmother, as inspiration for a bitchin', casual daytime outfit. Plaid bell bottoms? Far out, my friend...or maybe too far out for my daily taste. In an effort to cool down polyester paradise, I've flipped my grandmother's outfit...top to bottom. 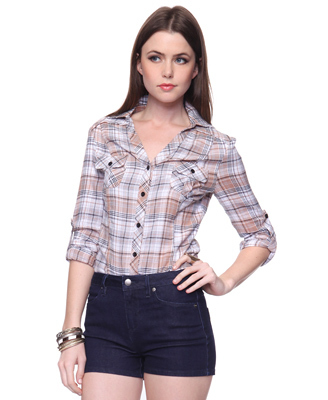 Instead of a blue polyester long-sleeve shirt, I have chosen a plaid button-down shirt from Forever21.com for a mere $13.80. 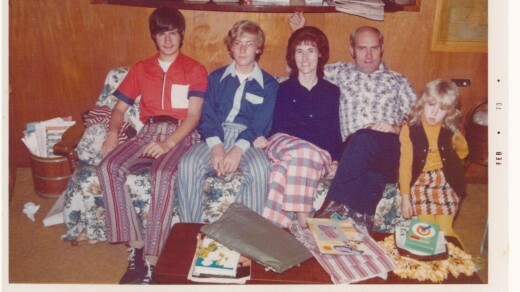 Although not vintage, this modern plaid shirt emulates the plaid pants that my foxy grandmomma is sporting in this infamous family photo. Instead of the plaid polyester bell-bottoms, I have found a super cute pair of jean bell-bottoms at rustyzipper.com for less than fifty dollars. 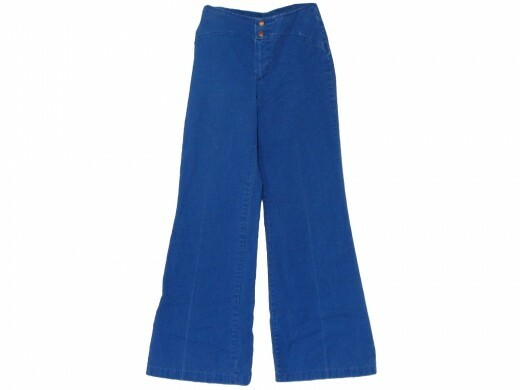 These are a true vintage pair of bell-bottoms, so they will give you that genuine seventies vibe to pull off this look. 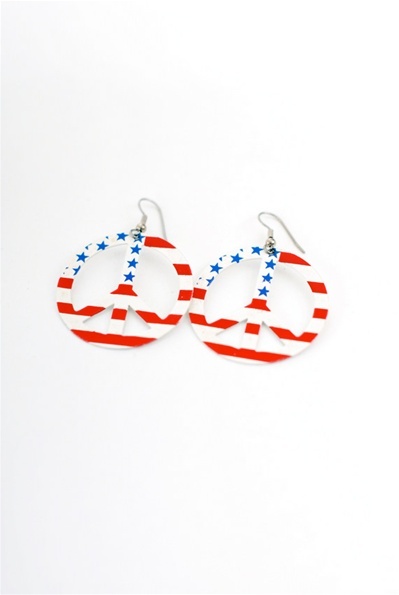 My last piece to wrap up this entire look is this vintage pair of patriotic peace dangle earrings. I know that this pair of earrings is the perfect accessory...like the sprinkles on top of a scrumptious vintage cupcake. 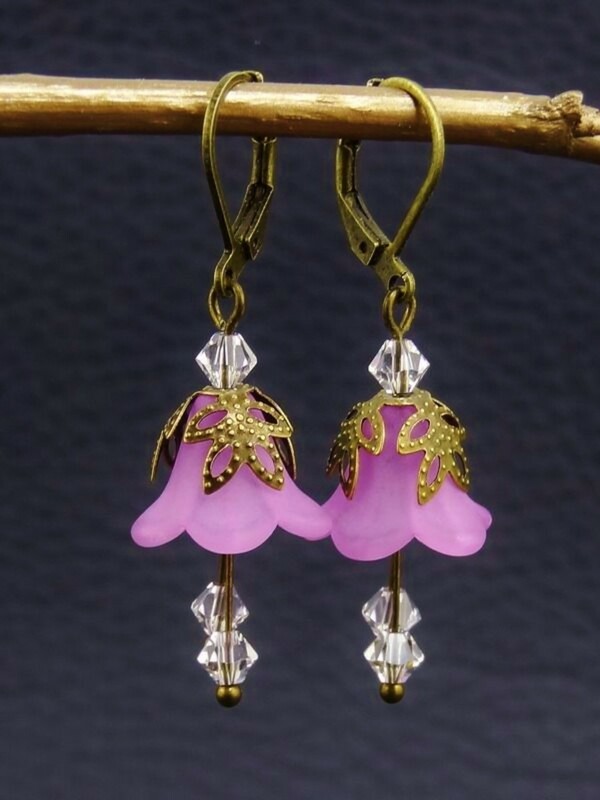 These earrings are also listed on spanismossvintage.com. Eat it up! The style from the seventies will forever be evolving and revolving within the world of modern fashion. 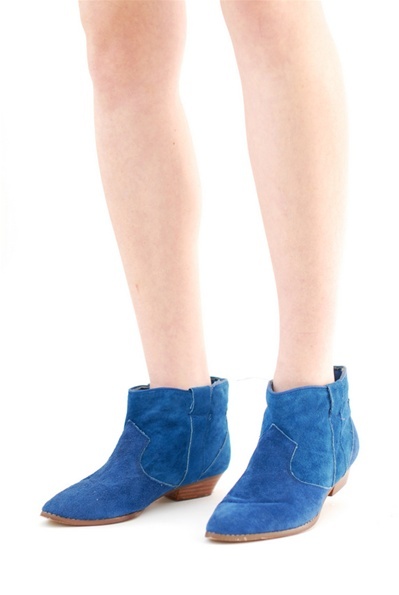 You can go to almost any fashionable clothing store and find an item that resembles the look of the seventies - bell sleeves, bell bottoms, hippie gear, fuzzy boots, platform heels, etc. So whether you buy seventies vintage or seventies style clothing, make it your own and find your own means of creativity through clothing...maybe your grandmother's old photographs will inspire you, too! Ebower - Thanks so much. Yes, these pictures of my grandparents are some of my favorite ever. They were so adorable. Thanks for reading and voting. What a great idea for creating your own vintage style! Also, I love the picture of your grandparents; it's so cute. I voted this up and useful! This was such a fun hub to read. Your grandmother is a beautiful woman. Loved that candid shot of the wedding photo. Nice how you paired finding similar clothing today to those worn in the past. Up and useful! maggs224 - i'm glad you enjoyed this hub. i love my photos of my grandmother..she was such a gem. yes, i look very much like her...and my mother, too. when you line me, my daughter, my mother, and her mother up...we look like a timeline! fluffy77 - i'm a 50s girl, but bell bottoms are too groovy! Thanks for sharing these pictures, I have always found many of these styles so great. I wouldn't mind wearing some of these today even, shoes,coats, and the bell bottom pants loved those things the most here. Hi Kitty, I have very much enjoyed reading this hub and the photographs of your Gran are wonderful. 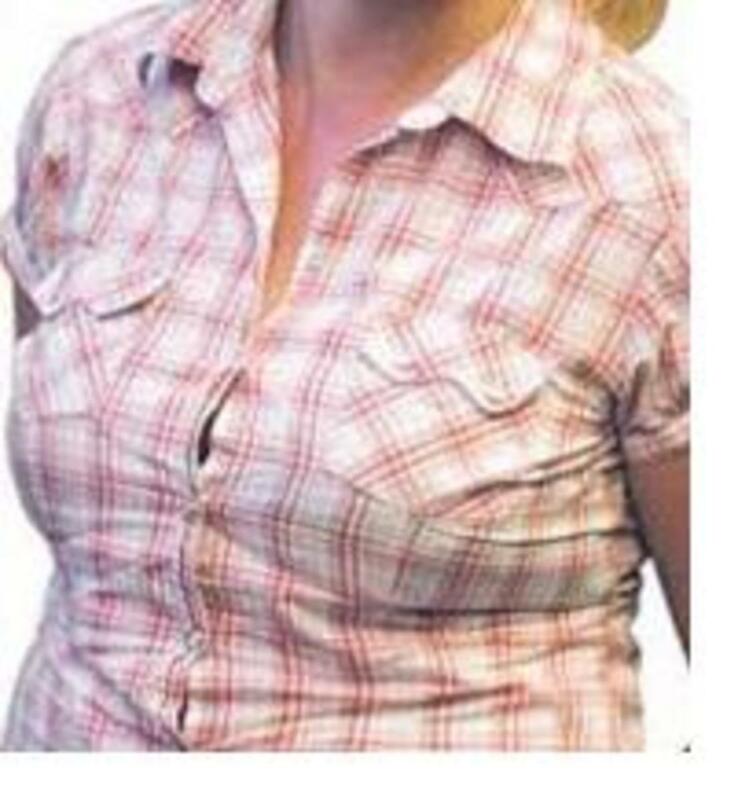 I was particularly struck by how much you look like your Gran. thank so much, dolores. my grandmother is still a beautiful woman. i just love old photographs, especially ones that show how awesome the clothes were in the 40s and 50s...and sometimes the 70s, too. thanks for the vote up! Women's fashions of the 1950s had such a lovely classic look and style. Great hub. The pictures of your grandmother are beautiful! Voted up!